Yes you can. However, the contents of the hard drive are encrypted using a code unique to your PlayStation 3. As a result, you will not be able to read any information from the hard drive. The otheros partition of the drive is not encrypted but will not be readable on a PC either. If you wish to backup your PS3 data, you must use the Backup Utility built into the PlayStation 3. 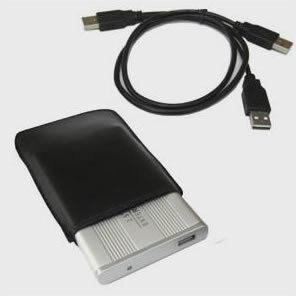 You can connect your PS3 Hard Drive to your PC using a 2.5" SATA to USB/Firewire caddy (pictured above), which cost between $8 to $20. I was recommended this blog through my cousin. I am now not positive whether or not this publish is written by means of him as no one else realize such designated approximately my trouble. You are wonderful! Thank you! If I have a Sata to USB hard drive encloser, can I copy the PS3 files to a USB stick and tranfer to a new PS3. Or better yet plug the now external PS3 hard drive into the new PS3 and it read game saves when I try playing the game. You will only be able to copy the savedata to the USB still. All other data can only be transferred using the backup utility to a large enough hard drive. You can use a external drive for saved data, but it must be copied to the PS3 before you can actually load it. The game won’t check the external drive for saved data. I put the PS3 drive in a hard drive encloser and connected it to my PS3, but couldn’t see it, what do I need to do to transfer the saved data to the PS3. You need to format the drive to FAT32 in order for the PS3 to “see” it. Once it’s in the correct format, you will be able to backup data to it and load movies, music and photos from it. I don’t want to do that its an 80 gig PS3 drive with game files saved on it already, it should already be FAT32, is their anyway to retrieve those files. In a prevous question I ask if the hard drive swap on Youtube could be used so I could backup the files from the 80 gig drive, it’s looks like in the video the PS3 doesn’t ask to format. You won’t be able to retrieve the files unless you connect it back to your PS3 internally. If you’ve already replaced the PS3’s hard drive with a different one, then this drive is useless now. Even though the drive is FAT32, the PlayStation Partition is actually hidden and locked to your PS3. What you should have done is used the Backup Utility to backup the data to a proper FAT32 drive and then restore it to the new drive. If you get it repaired, the hard drive should work on it again. If its has a YLOD, you can fix it temporarily to get the data off it and restored onto a new console. Other than that, the data is stuck on the hard drive. I think it has YLOD, it comes on green, then yellow and back to red. What’s a temporary fix, taking it apart and resoldering the componets? It also has a game stuck in it, I’ve tried to get it to eject, but it wont stay on long enough.